So recently I’ve been asked to review more ramen restaurants located in the Shinjuku/Shibuya area as it would be more convenient for those staying there to get to. I’m not gonna lie, I was hesitant at first because the area is known to have overrated, franchised ramen shops and those whose quality has gone down since they gained popularity. 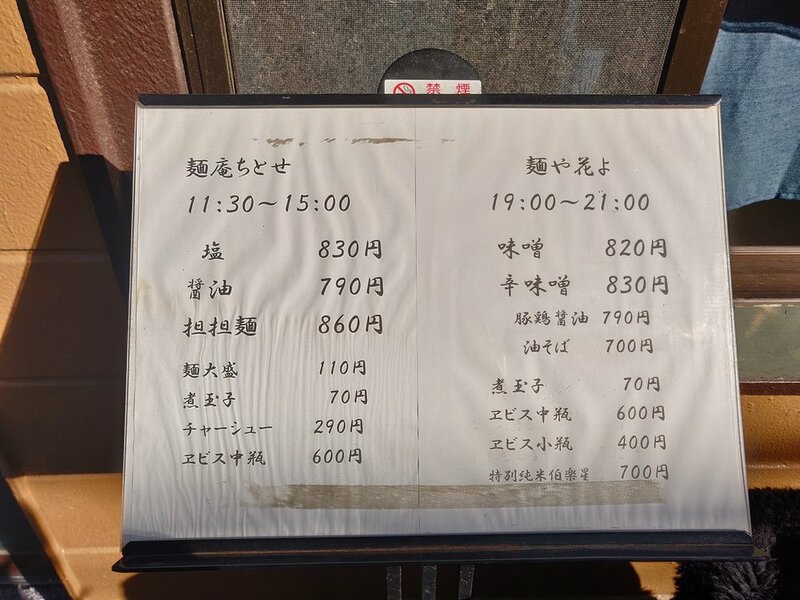 Shinjuku and Shibuya has a ton of foot traffic, but rent is extremely expensive and in order to offset the prices, they end up settling for lesser quality ingredients for the ramen. However, one shop decided to offset the expensive rent prices by moving a bit out of central Shinjuku and using the saved up cash to invest in their amazing bowls of ramen. Menan Chitose is a bit far from Shinjuku station, but still easily accessible by both Tokyo metro and by foot so hopefully you'll make a visit on your next trip and try their fantastic ramen varieties. If you decide to come by Tokyo metro, the closest station to the shop will be Akebonobashi which is a five minute ride from Shinjuku station. If you decide to go by foot, it's a brisk 20 minute walk, perfect to work up an appetite before sitting down as they have multiple options here and you might end up getting more than one. Menan Chitose is open from 11:30 to 15:00 and closed on Wednesdays. On Thursday, Friday, and Saturdays the restaurant reopens at night from 19:00 to 21:00 as a different brand called Menya Hanayo. The menu shown above shows the available items for Chitose on the left and Hanayo on the right. This review will focus strictly on Menan Chitose with a review on Hanayo to come at a later date. For Menan Chitose the available items from the top are Shio Ramen, Shoyu Ramen, Tantanmen, extra noodles, soft boiled egg, extra char siu, and Yebisu beer. While not shown on the menu outside, they also have a non soup version of the Tantanmen in the ticket machine inside. I was able to visit with some friends on this occasion and tried the Shoyu Ramen, Tantanmen, and the no soup Tantanmen. After purchasing our tickets we were able to sit at a table (not pictured) instead of the counter so if you come with 3 people, you can sit together as a group. I started the meal off with the Tokusei Shoyu Ramen which came with extra char siu and soft boiled egg in addition to the already adorned menma bamboo shoots and green onions. The soup base here is a mixture of Japanese Hakata chicken, Rausu konbu (native to Hokkaido), and a variety of shellfish. Due to the gentle nature of the ingredients, the broth is simmered on a low heat extracting as much flavor and umami as possible without pulling too much collagen from the chicken and bitterness from the seafood. Resulting soup is very gentle and refreshing getting hints of sweetness from the shellfish and umami from the konbu. The chicken gives a nice fatty depth to the bowl as well as the seasoning oil which comes from the chicken fats. Shoyu tare is not too salty pairing pretty well with the gentle soup. I quite enjoyed the airiness of the soup which comes from the use of light soy sauce for the tare. It helps accentuate the seafood flavors without overpowering it while also giving it the subtle seasoning to the char siu slices which, in my opinion, desperately needed it. To be honest I could have done without the extra char siu pork slices as it was a bit bland for my taste. I could understand the reasoning however as a more fatty, flavorful char siu would have muddled the gentle flavor of the soup. Instead the char siu seems to be cooked sous vide and, while very juicy, doesn’t have the kick I would have liked. Menma bamboo shoots were crunchy, rather than stringy which worked to add a different texture variety that I enjoyed. The green onions were nice and fresh, cutting through the fattiness of the chicken oil. Soft boiled egg was cooked a bit longer than I would have liked, but nothing to complain about. Highlight for me however were the homemade noodles. The noodles have a very strong wheat flavor which was fantastic with the chicken and seafood broth. I felt like the wheat added a bit of nuttiness and roasted flavor notes which enhanced the overall taste of the bowl. Noodles were straight, thin, flat noodles that worked well with the thin soup. Overall, I thoroughly enjoyed Chitose’s Shoyu Ramen. Next off I tried my friends’ Tantanmen and no soup Tantanmen. As a warning, I’m not the biggest fan of tantanmen and have never really been able to tell the difference between bowls so take my following review with a grain of salt. On the left is the soup version and the right is the no soup version of the tantanmen. I think the broth used for the tantanmen is the same as the Shoyu Ramen, but has sesame paste and chili added to get the tantanmen flavor profiles. The spice level is moderate and one that most can probably handle. Adorned with the bowl is the ground pork sauteed with sesame oil and chili which is what gives the bowl its spiciness. Noodles were the same as the Shoyu ramen and gave a nice wheat aroma to the bowl, but the flavor of the sesame paste and chili definitely overpowers the flavor of the noodles. Overall the flavor is consistent with other tantanmen I’ve had and didn’t think it was anything special. If I were to choose between the two I would say the no soup version was better. The no soup version uses a condensed sauce of the tantanmen soup with a bit more sesame paste, oil, and chili. The noodles were different here, using a thicker flat noodles which pairs really well with the sauce. Ground pork is the same as the soup version, but the flavors seem more enhanced since its not diluted by the soup. I thought the overall balance between the chewy noodles, condensed sauce, and spicy ground pork worked better in the no soup version than the former. Overall I thought Menan Chitose was a fantstic ramen shop. Chitose is run by a husband and wife duo and their friendly service gives off a great mom and pop vibe. The restaurant is very clean and relaxed, reminding me of an island cafe. Lines here are insanely long on weekends though so be sure to come early if you want to be one of the first to be seated. While it is a bit of a walk from central Shinjuku, I think the short walk is well worth taking for Chitose. Definitely way better than most of the franchise ramen shops operating near the station and I think most will enjoy the homely environment.